afternoon nap | doberman pizza. coming from a northern country with a cool, temperate climate, I’ve never really found myself wanting or needing a siesta in the afternoon. Canadians don’t really have such a concept; we work from 8:30 to 4:30, with a one-hour lunch break. Not so in Vietnam, a tropical country with a hot and humid climate to match, where people walk around with tans, parasols and conical hats, and where a lunch break of at least two hours is de rigueur. At first, it was funny seeing everyone go to sleep at two in the afternoon, or seeing a children’s class pause from 12:30 to 2:30 and seeing the adults follow suit with their younger counterparts. Now that I’ve been here for a couple of months, though—and having made the mistake of taking walks outside with the afternoon sun beating down on me—I can definitely see the value of naptime. 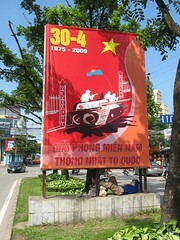 This entry was posted in asia chronicles, baha'i blog, journal and tagged travel, vietnam by danger. Bookmark the permalink.